The holidays - and my holidays from school - are fast approaching! Today was my last day in clinical so we wished our patients the best, said many a thank-you to the amazing nurses on the unit and cleaned out our lockers. I'll miss the Thursday-Friday routine but I will not miss waking up to see 5:30 am on my alarm clock. Tonight I have the wildest plans. I'm going to come home from work around 7:30-8, run a bubble bath, put on my PJs and either watch a movie, do some baking, or just fall asleep early. John's doing a boys night tonight and I'm a little glad for the night of nada. Speaking of baking, I made about 75 small gingerbread men on Wednesday night to give to the Thursday night instructional staff at the pool. They were gone in like 10 minutes. I will put up the recipe as one of my "25 posts 'til Christmas". They were good. 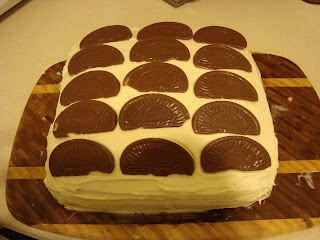 I also made a cake inspired by a Terry's Chocolate orange that my dad got me earlier in the week. I mixed up a store bought white cake mix and then cut it, filling the middle with a layer of chocolate jellow pudding that I added diced mandarin orange slices to. Then I iced the cake with cream cheese frosting and added the chocolate orange peices on top. I cannot wait to try it. Yum yum yum. I love flavoured chocolate like orange and expecially mint. I bought some really good candy cane bark from Loblaws the other day....oh man it's tasty. I'm thinking of baking up vanilla cupcakes and then topping them with a peice of the bark. okkkkk I gotta get ready to go to work. Did you know I'm friends with celebrities? My friend Thomas' TV debut! Haha he's the best, this is why I love him.